Addon Description: This block is used to display recent activity within a set guild that will show stuff like achievements and epics aquired. very minimal setup required. 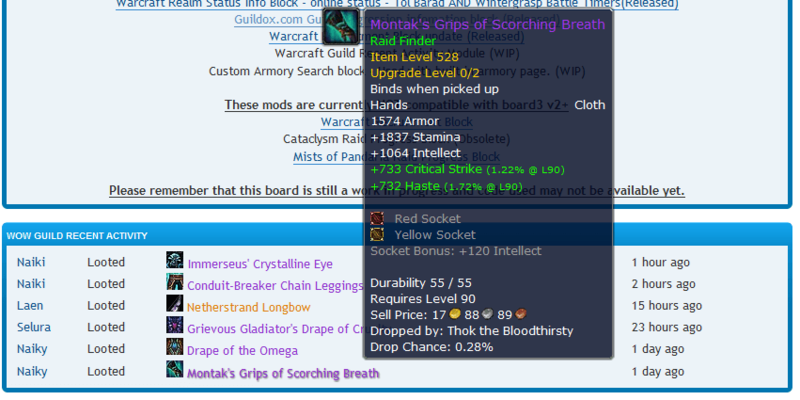 just input region/realm/guild and set the amount of items you would like to display 1-25. theres also an option to disable images in the block so you can disable them if you have wowhead tooltips set to display icons. 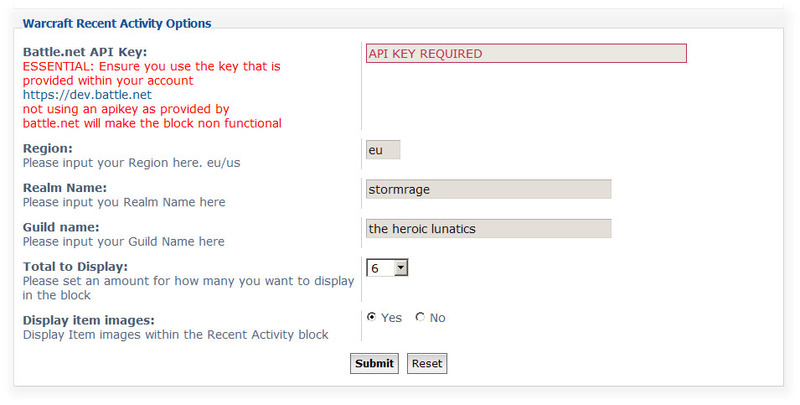 2. navigate to Extensions -> Portal -> Portal Modules and click "Add Module" for the Left OR Right Column and add Warcraft Guild Recent Activity. code version bumped to 2.1 instead of 2.0 due to missed error in code for update pushes. Good evening. On your site, it shows things within an hour or less. What does it take for me to get something similar good sir? Or does it just happen to be my server? Word. Look forward to it. Just a question : is it possible to take in account the language ? I'd imagine you could search for the code within the extension relating to the US version and switch it over. language selector been added to ACP for extension. just put a test on here and selected russian. added lots more lines to language file so they can be changed easy now without editing code. "looted" "minutes" and so on now editable.